The difference between these two hardwood flooring types is wear layer. Wear layer is the thickness of wood above the joinery. It's the meat on the bone, so to speak. When you visit the cathedrals, castles, and chateaus of the world, these are the centuries-old wood floors passing the test of time. BECAUSE IN THE REAL WORLD EVERY WOOD FLOOR WILL EVENTUALLY NEED SANDING! "Do I still have a floor?" Retailers are always VERY optimistic! Why put two-thirds of the tree below the nails, right? And if we can yield 2, 3, 4 times the flooring from a single tree by veneering the hardwood, why not, right? as long as the engineered flooring is built to last. "Why cut down good trees to make throwaway flooring?" next to flooring with all the thinner wear layers sold out there. Then, I cropped the photos to show the full wear layer of the Bolivian Rosewood. It will always be on the left and darker than anything on the right. Look carefully at the sample on the right. Look for the line between the hardwood veneer on top and the substrate to which it was glued. That's it. That's all. Then read on for the old Director's take on what can be sanded and what can't. 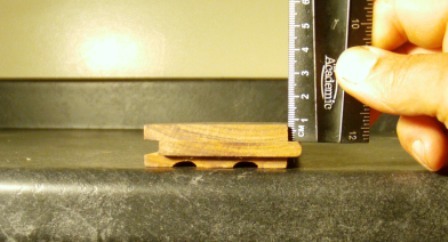 This last photo is full profile, no cropping on top or bottom because both samples are a full 3/4" thickness and both samples have a full 1/4" wear layer, (6 mm). The only difference between these two hardwood flooring types, of course, is construction. So why isn't more flooring made like this? Believe me, there has been a lot of living and learning on engineered flooring. the bigger they get the harder they are to control and the more they have a mind of their own. Thicker veneers in certain species are more likely to break their bond from the substrate beneath them, OR, fracture than other species. You will also notice a variety of substrate choices. "So, do I still have a floor after the first sanding?" When I am called to attempt a delamination repair on an engineered floor, it is usually one of a couple brands that comes out of the box with a 3 mm veneer. Prefinished. After sanding and then finishing with a polyurethane coating, it comes lose on the groove side of the board. Not the tongue side, but the top of the groove side. That is where the veneer will become too feather-thin to hold still and up it pops. Solid hardwood flooring types are sold with this same wear layer and just because it isn't engineered does not make it any less vulnerable to delamination. Avoid resanding any existing floor with a wear layer of 3 mm or less. You have a special needs floor on your hands, whether it is solid or engineered. Be vigilant on your maintenance schedule and if it absolutely has to be sanded just know you are rolling the dice and use only a random orbital type sander. Only purchase hardwood flooring types with a wear layer of 4.3 mm or more.